OK, it’s winter. It’s cold. No flowers are blooming. So…is it time to take a break from photography? Heck no! It’s time to get out the warm clothes and get shots that you can get ONLY in winter. First let’s talk about gear. With nature photography, one spends a lot of time standing still, so you can’t depend on moving around to keep you warm. To get those rare, really special shots, you have to take a LOT of shots…and that takes time. So, it’s important to be comfortable for many hours in the cold. Suited up and keeping warm for winter photography. © Leif Otto. Let’s start at the top and work our way down. Some of these are obvious, some are not, but I’m surprised at how often I see nature photographers who are so anxious to get out of the cold that they miss many good shots. Head: I like to wear a hat and cover my ears. On a really cold day, I’ll put my hood up as well. A scarf around my neck really helps keep the draft out. Body: I make sure to have several thin layers. Thin layers work better to keep me warm and also allow for easier movement than one thick, heavy coat. Typically I’ll wear a t-shirt or long underwear, a turtleneck shirt with elastic cuffs, a fleece pullover, a vest, and a windproof coat. Legs: I wear thick running tights and winter pants. When it’s really cold, I’ll pull out the snow pants to wear over these, too. Feet: I wear thick wool socks and winter boots. I make sure my boots are loose enough to allow circulation, but not so loose that walking becomes a chore. And finally…hands: Sadly, this is where I often get cold first. I like to have gloves that allow for easy maneuverability and control of my camera settings, but that are still warm enough for comfort. I wear glove liners and medium-weight gloves with wind blocking. I also put chemical-based, shake-and-heat hand-warmers into my gloves. This works for me for about an hour in sub-20 degree weather, and longer at warmer temperatures. I’ve talked to some photographers who say they like the mittens that flip open. Sometimes I will choose to sacrifice dexterity for warmth and put on thicker gloves. On those days, I may opt to have my camera on autofocus instead of on manual focus, which I prefer. There are some choices and compromises that you will have to make for comfort. Magical, ephemeral, frost formations, only seen on the perfect winter morning. © Carol Freeman. One of the most important things you can do to keep warm is to be vigilant about having as little skin exposed as possible by closing all the gaps. Make sure your socks cover the gap to your pants, and that your coat sleeves cover your wrists. I have a coat that has adjustable wrist openings so I can cinch them tight to my gloves. Lovely, otherworldly landscapes appear when bubbles are frozen in ice.© Carol Freeman. Now, you are suited up and ready to go. So, now what? 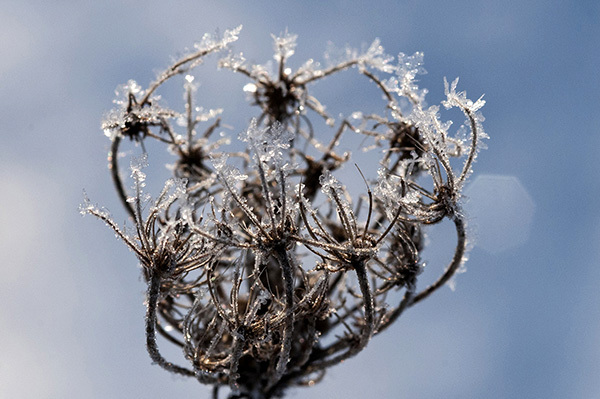 One amazing thing to photograph is early-morning frost. When freezing nights are cloudless and wind-free, you can often find beautiful frost gracing trees and grass the next morning. These formations are magical, and are only around for a short time until the sun melts them. 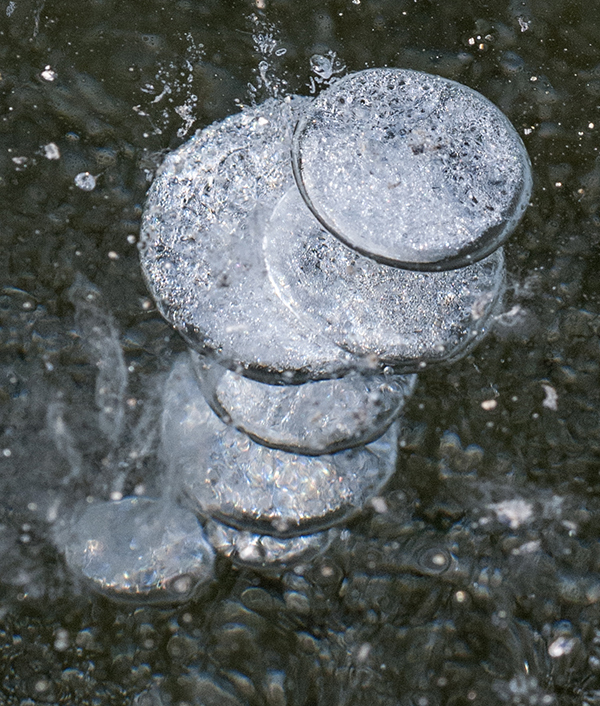 Also, when the streams or lakes freeze up, often you can find leaves and bubbles suspended in the ice, creating lovely frozen compositions. 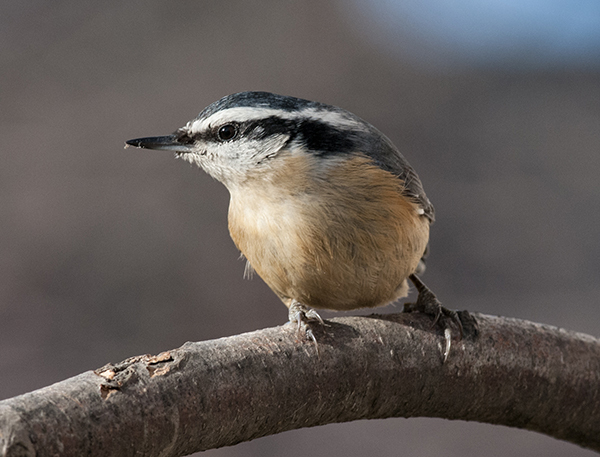 An unusual irruption of this cute little red breasted nuthatch this winter at the Garden! © Carol Freeman. Another treat is seeing the rare birds that come to the Garden only in winter. One fun winter visitor that has invaded the Garden this year is the cute, red-breasted nuthatch. They are bold little birds, and you can sometimes see them by the feeders in the Enabling Garden. You can fight winter, or you can embrace the season, and photograph those rare moments only seen on the coldest of days…made all the more rewarding for the bit of extra effort it takes to get them. Your clothing suggestions are spot-on-target and I love your photos. At our First Saturday Chicago Botanic Garden Photo Walk in December ,2012, we added the suggestion to carry a spare battery in an inside pocket to keep it warm. Batteries are less chemically active at low temperatures and tend not to last as long . You’d hate to spend all that time and effort and have camera battery energy failure. Another handy item to have in your jacket pocket is a 2 gallon ziplock bag obtainable at your hardware store. 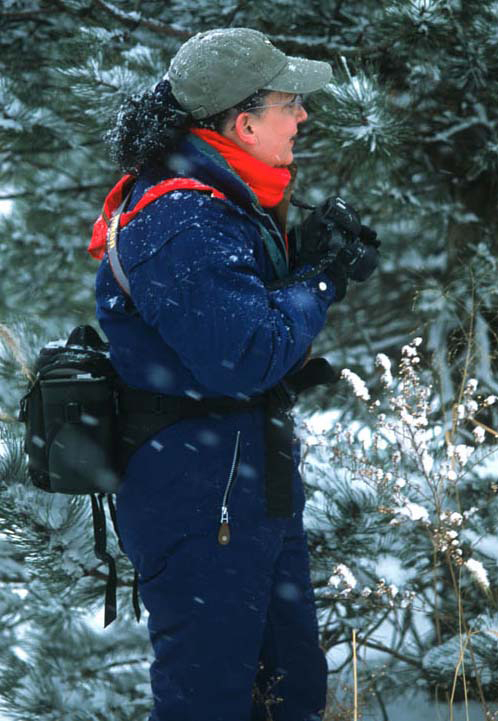 If you get caught out in wet snow or rain it can protect even a large DSLR camera from moisture. If you’re outside on cold days, putting your camera inside a ziplock bag before reentering a warm humid environment (any heated building) can keep condensation from forming on and inside your camera which could short out and damage the camera’s electronics. By keeping the camera sealed in the ziplock bag for about an hour or so until the camera warms above the dew point (temperature at which warm air cooled by cold surfaces condenses) the camera will stay dry. Don’t even think about taking an unprotected camera from the cold into the tropical greenhouse. By the way, the Chicago Botanic Garden conducts a free no registration required photo walk which meets at 9::00 a.m. in Alsdorf Auditorium on the first Saturday of every month year around. Check the CBG web site as it sometimes meets in other locations when the auditorium is not available. Another way to make sure of the meeting place to to check with the information desk in the CBG Visitor Center on your way to the photo walk. We spend about one-half-hour illustrating how to get the best shots with any camera and then go out to garden locations to shoot till about 10:30 a.m. Enjoy your photography in any weather! I was wondering do you ever hold the Photo Walk on Sundays. I was looking forward to participating on a walk but unfortunatly, I work every Saturday. Thanks for your interest in the CBG photo walks. We’ve been running the photo walks on the first Saturday of each month to make easy for everyone to remember the date. I’ll discuss the possibility of a Sunday photo walk with our staff photographer.